I’ve been performing in bands for almost fifteen years. I traveled a lot at first, but my family has kept me close to home for a while now. 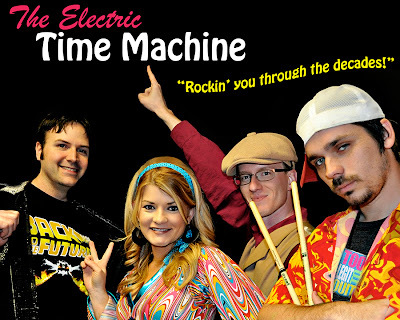 My current band is called “The Electric Time Machine.” Since this is the wedding issue of the magazine, I thought I would let you know about us because weddings are our specialty! Our motto is “rockin’ you through the decades,” and we do just that! We play everything from Chuck Berry to Lady Gaga with a lot of 80’s in between. We dress in costumes to represent each decade and as you can see in the photos, I am the 60’s! We are currently a four-piece band but plan to be a five-piece by spring with the addition of a keyboard player. If you know anything about bands, you know that they don’t always get along, aren’t really friends off stage and very often break up because of “creative differences.” I have been so fortunate the past eight years to be with a group that does not fit any of those descriptions. The four of us have an incredible chemistry that translates very well on stage. Everybody’s abilities and unique personalities fit together like pieces of a puzzle that result in a fun, high energy show filled with unexpected raw talent, not common in a cover band. So let me introduce you to the guys… On bass guitar is David Larsen. Playing as our 70’s fly guy, David’s bass lines can emphasize the groove of all styles of music, while keeping out of the way of the arrangement. We kind of consider him the “band geek,” but it’s pretty much because he’s a very meticulous, musical genius. Representing the 90’s is “Too Legit To Quit” drummer Jason “Chafa” Chafatelli. With a drum set that lights up the night, his funk rhythms fill the room making it nearly impossible to stay in your seat. And last, but certainly not least, is lead guitarist Jason Miller. In his totally rad 80’s attire, he rocks rhythms with an emphasis on “full chords,” while his solos are a mixture of tone, emotion, speed and groove centered around scales and modes. I saved this Jason for last to also mention that we’ve been playing together for the full fifteen years I’ve been in bands. We met at Ole Miss and he and his wife moved here right after my husband and I did so that we could continue to create music. He’s like a brother to me. I am so blessed to have been in a band for so long with such an insanely talented, big-hearted, incredible guy. I guess, since I’m describing members, I shouldn’t leave myself out. With hair and Go Go Boots like Nancy Sinatra, my vocal style could be described as a Southern American Adele fused with Janis Joplin and a little Pat Benatar. “Me and Bobby McGee” is my most requested song and as a big fan of Janis, I certainly take that as a compliment. So book my band “The Electric Time Machine” for your wedding reception, corporate event, private party or club. You won’t regret it! We will take you back to your glory days no matter when they were!